Home Companies Shenzhen Lepower Electronic Co.,Ltd. Payment terms T/T, L/C, Western Union, Paypal, MoneyGrame etc. 20-40 working days for sea transportation. High Efficiency Version: Built with SUNPOWER® solar arrays, solar conversion efficiency up to 23.5%, while most panels in the market are only 15%. USB port (5.5V/2A) for charging your 5V powered gadgets, and 18V DC output (18V/3.3A) for charging your laptop or storage battery. What You Get: Industry-Leading 24 months limited product warranty! 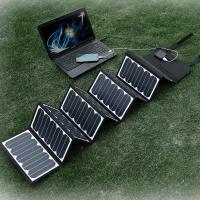 Poweradd 60W solar panel charger, laptop connectors, DC cable, charging clip. Uniqued voltage regulater design to ensure stable voltage and current, protects your device while charging. High Quality: PET laminated solar panels with high-wear PVC fabric, ensures waterproof and weather-resistant durability. 10 notebook connectors are included, please check the model, size, voltage and power of your original adapter to ensure compatibility before using.